My favorite definition of mother is "a person who does at least two impossible things before breakfast." So in honor of mothers everywhere, I offer this design using the count-LESS technique of cross stitch. Notice I didn't say count-free. You still have to do some minimal counting. It's just that you're able to work with a single color within larger blocks without as many color changes. And just like mom, you've found a way to make something beautiful using few steps than everyone else. "For My Mother" in yellows, oranges, reds. Includes lettering for "Grandma." The end result resembles something you might see on a Tiffany lamp or stained glass window. Instead of stitching the crosses, work the backstitches first. Then you're free to move around! Take it to the kitchen, the back yard, the doctor's office. All that's left to do is fill in each block with stitches of the same color. Easy! Of course, you can do the cross stitches first. It's up to you, but if you like to take your projects with you wherever you go, this does save you a bit of fumbling with charts. This also makes an easy project for a first time stitcher or for a child learning cross stitch. What better gift for Mom on Mothers Day! 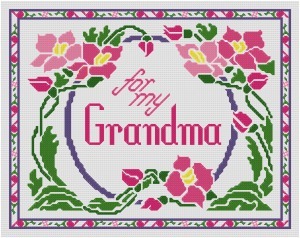 The pattern also includes lettering for "Grandma" in place of Mother. "For My Grandma" in pinks and purple. Includes lettering for "Mother." For other Fabric and Finished Design Sizes, see our handy stitch count table. I embroidered "Mother's Day Floral" on 14-count Aida using DMC floss in two strands for cross stitches and one strand for backstitches. For detailed stitch diagrams, follow the above links or click on the "How to..." button on the left menu. Click here for the printable Pattern with full instructions, floss numbers and stitch count. A new window or tab will open so you can continue browsing here. 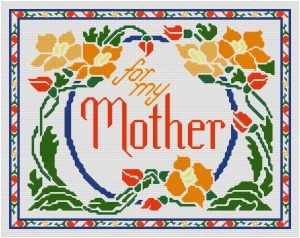 You can print all pages of the Mothers Day Cross Stitch chart or just the pages you wish. Feel free to save it to your hard drive for later printing.